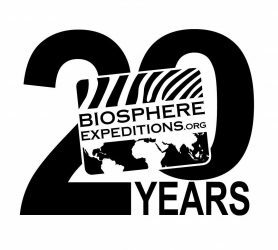 Kierkegaard was right in many ways, as by looking back over the last twenty years we can see what Biosphere Expeditions is all about. Having started in a small way with only two expeditions, we have – through our participants, staff and partners – contributed hundreds of thousands of days to conservation all over the world, supporting many NGOs and scientists to acquire the data and funding they need to make an impact. You can read in the anniversary issue of our annual magazine about the difference that this work has made to many places and people. And what about the planet, the living biosphere, what difference have we made to that? We have spent the last twenty years helping to build the data that improves the chances for wildlife. And we will continue to do this essential work, as without the science underpinning our understanding of the world, we cannot make rational choices in support of its future. But we need to do more, especially these days, when it is difficult sometimes to be positive about the global environment. So for the next twenty years we are also going to be doing more campaigning – talking about limits to growth and new economic/environmental models that might work better for the long-term health of our planet. We will be talking about vegetarianism and making your flights matter – travelling with a purpose, in fact, living more thoughtfully. And this talking will make a difference as the answers are in our hands and through discussion and collaboration, we can effect positive change. Everything that we do now, in this anthropocene, this time of humans, matters. The latest science shows that things need to change now, and Biosphere Expeditions will play its part. Watch this space/blog for further developments as our anniversary year progresses. Congratulations on your 20 years of wildlife conservation expeditions! I am proud of having been on 8 of those expeditions. …and we are grateful that you did join us John. Do so again. I am sure together we can overcome your challenges. Thank you for an unforgetful life moment (not experience!) in 2003. Real science, real change and real return with golden memeories. 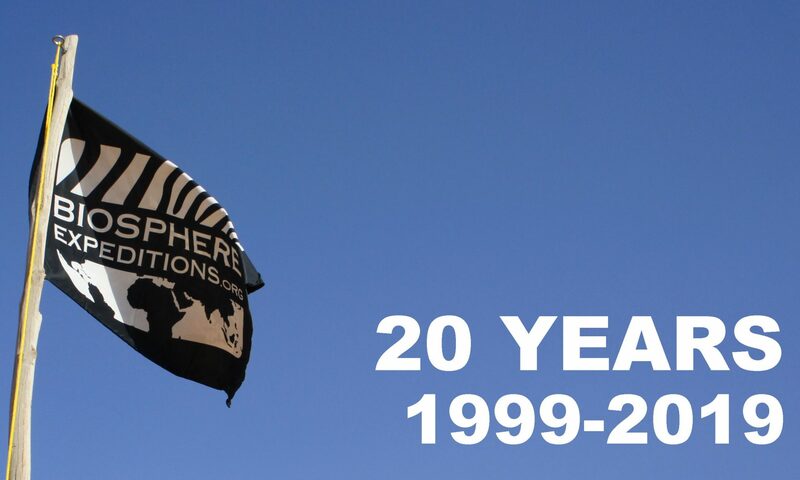 Big congratulations on your 20 year anniversary and I am sure another 20 years will be see you grow exponentially and produce extremely happy voluntourists whilst combatting the vagaries of negativities such as ‘Disneyfication’ of real sentient animals (including humans!). The laptop I am using to write this message has all my photos from Namibia 2003 (cheetahs). They provide a constant positivity just as Biosphere Expeditions do. Hurrah! Thank you for your kind words Phil – much appreciated. However, growth is not what we’re after (see below). We think what the planet needs now is an orderly retreat, not the current obsession with endless growth on a finite planet. Biosphere Expeditions believes that, as humans, we have designed an economy that is dependent upon endless growth. We have also designed an economy that generates incremental profits by constantly increasing productivity. Endless growth on a finite planet is an unhealthy and unsustainable mathematical impossibility. Cancer is perhaps the best analogy to endless growth. It grows until it kills the body that hosts it. Therefore Biosphere Expeditions is not committed to growth. We want to do a limited number of projects and we want to do them well, making a difference to our partners and local communities on the ground as well as the wildlife and habitats that support them. We want to retain full control of our processes and actions, with our left hand knowing what our right hand is doing. If there is growth, we will make sure that it is sustainable and necessary, which means it should be based on local demand and conservation need. Our economic decisions will be based on this maxim.